Flavor Text: Bones they were, broken and blackened. The longer ones had been cracked open for their marrow. Well Dragon Bite can be easily avoided by just being careful to not challenge with the risk of a dragon. Dragon Fear (QoD) is much harder to avoid as all that needs to happen is someone win a military challenge against the Feared characters controller. Sure they can save against it (which they typically can't against Bite), but you are much more likely to eventually be able to kill the character if that is your goal. in a melee game i find that Dragon Fear is much more useful just because it makes it harder for your opponent to keep his Heavies on the board, being able to attach it to Euron, Fat Robert, Blackfish, or Red Viper really neuters your opponents options. At what point does this card's effect hit? Since it just says "participating" - does that mean the moment they kneel the card (if a Dragon traited character is already participating) the attached character dies before the challenge resolves? What about when you Ambush a Dragon into play to participate in a challenge? Yeah the character would die immediately. So if they attack, and then you ambush in a dragon and defend, the character immediately dies before the challenge resolves. And does this also count as a Terminal effect because of the participation condition? Yep. So you couldn't save the character unless the save would remove it from the challenge or play somehow. Sadly, yes. To save from it you would either have to save them & remove them from the challenge at the same time, or save them and remove the attachment at the same time, or save them and remove the dragon from the challenge at the same time. Not sure what card would give you this ability. Right - because Unburnt performs both actions, removes it from the challenge as well as saving it from death. Makes sense - thanks! This + Hall of Dragons (AHM) = WIN! Does it means that a character with a dupe is killed when in a challenge with a dragon and the dupe can not save him? No. They can still discard a dupe; however, the attachment remains attached. So, the character is still operating with the threat of impending death. @Doulos, since the character is still considered participating in a challenge with a Dragon, doesn't this just create a terminal effect - since even saving the character once doesn't remove the effect that is killing him? Making it to where you can't even bother saving him with a dupe. Oh duh! I was confusing this card with Dragon Fear (QoD). Yes, the effect is terminal. The character would have to both be saved AND removed from the challenge at the same time. As far as I know there isn't a card that does that. Either this isn't right or I'm reading it wrong. SInce the kill effect is constantly happening as long as the character is participating in a challenge with a dragon, any save would need to either remove this character or the dragon from the challenge, this character or the dragon from play, or the attachment from the character as well as 'saving' the character. In addition, if you can't succesfully save the character, you cannot even attempt to save them. Therefore you cannot discard a dupe to this effect. Unburnt would work, as would Core set Viserys Targaryen, but I think those are the only two I can think of right now. If you can't discard a duplicate to save the character, then does the character and all of its dupes end up in the dead pile? The character ends up in the dead pile and the dupes go to the discard pile. This is because dupes have no traits, titles, or text. So, they just get discarded when the character they're attached to leaves play for any reason. @Kahrion - you are correct that "if" that attachment was on a character with the dragon trait then they would immediately die when they participated in a challenge. Also note that you cannot save from this effect unless it either removes the attachment at the exact same time or has them leave play another way - such as an ability like "save and return to hand". 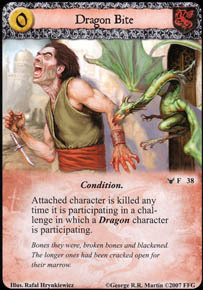 If this is attached to one of my Stark characters and I defend with him and with Deepwood Mercenary and decide to remove DB with DM's response, what happens to attached character - is it killed or not?